Susan applies her extensive academic, life and work experiences to energize and engage people as she shares her insights with them. Combined with a powerful and empowering speaking style she brings topics to life and interacts extensively with her audience leaving them ready to act and flourish. 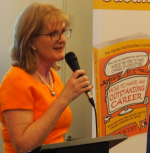 Susan is a passionate speaker on topics including career resilience, preventing burnout, career development and building energy. Or book her for your next conference, workshop, keynote or development programme. Sign up to my mailing list and you'll get information, news and tips to boost your energy, develop your career resilience and prevent burnout.